Everyone often wears a black bar in the winter. A black person will give people a feeling of sulking, and a gray scarf can make the overall shape less serious and have a “breathable” feeling. If you use a white scarf at this time, the contrast is strong, it will be a bit dazzling. Of course, it’s not that white scarves are wrong with black clothes, but gray makes the overall look milder. Dark gray is also the color that everyone wears in autumn and winter. 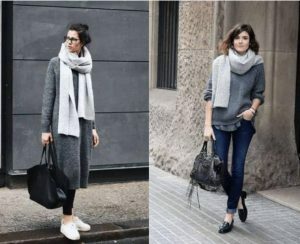 The dark gray clothes and the light gray scarf are layered together, making the shape rich and refined, and it looks very clean. A ash may not be the color that we wear every day, but the smoky gray is very strong. The same color but different textures are very interesting and have a different feeling. Everyone can try it, maybe there will be surprises. 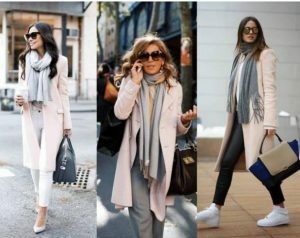 Pink and gray are also classic, very elegant, gray to suppress the tenderness of pink, afraid of being said to be tender, and want to wear a pink coat, then a gray scarf. 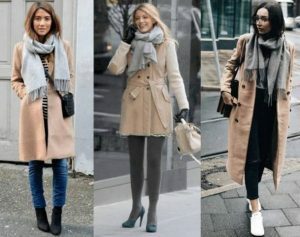 The camel coat is also the basic color, and the combination of the low saturation of gray and camel is a very soft match, which gives a very gentle feeling. 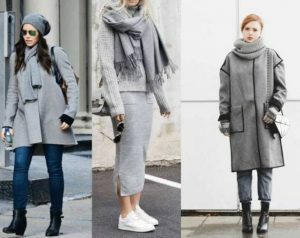 If you still feel that the gray scarf is very faint, you can also choose a gray-tone scarf with a little change, which is similar to the gray scarf, and will add a little jump. All in all, in short, the gray scarf is versatile, no need to use your brain, so if you don’t know what scarf to buy, pick a blind eye, buy a gray one, you can’t go wrong. It will always be the one in your closet that doesn’t matter what you wear, it can be taken away and it is not easy to make mistakes.